No one really plans to get sick and no one thinks they’ll need to stay in a hospital for several days or even several weeks. Most times, it just ends up happening and suddenly your whole world is turned upside down. Your daily routine is no longer anything like it was before. This was certainly the case for Becky Bolduc and her husband Jonathan when they arrived at Maine Medical Center following a very tense, 5 hour ride – by land and by sea – from the family’s home on Islesboro, Maine. A small island of roughly 600 year round residents located just off the coast of Camden. As it turned out, on that sunny day back in August 2013, the Bolduc’s first child, Emelia, decided to enter this world about 10 weeks before she was supposed to. 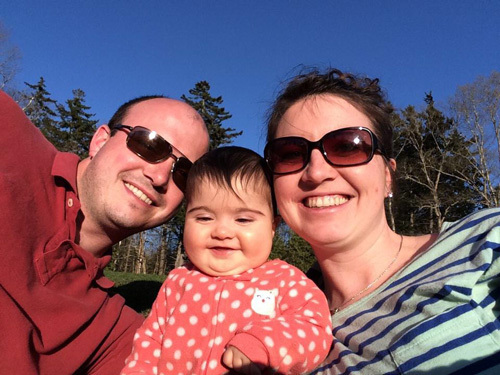 After arriving at Maine Med, Emilia was born weighing just 3 lbs. 4 oz. Shortly after delivery, the doctors and nurses explained to the couple that baby Emilia would need to stay in the neonatal intensive care unit (NICU) until she was strong enough to be cared for at home. Likely 8-10 weeks. Following a few very tense hours of scrambling to inform friends and family about what was going on, the couple were then approached by hospital staff to let them know about the nearby facilities available at the Ronald McDonald House in Portland. Looking back now on the weeks that she spent at the Ronald McDonald House, Becky says she appreciates even more the freedom from having to worry and stress about everyday tasks such as cooking and cleaning or driving back and forth from the hospital.